Sometimes you hit up a popular restaurant a year or so after it opens – well after the height of its popularity – only to find that the venue doesn’t quite live up to its reputation. In the case of The Black Tap in New York City, this couldn’t be farther from the truth. We visited New York City a little over a year ago and visited the Broom Street location and instantly fell in love with the menu, the character, and the owner of this incredible – yet tiny – hot spot – view that story now. This week, we headed back to the Big Apple to hit up this popular burger and shake joint to see if it’s still as good as the first time we visited. What we found was that it was even better! The Black Tap’s Midtown location has been open since October 2015 and still attracts a line down the street daily. This time we visited Black Tap’s larger Midtown location at 136 West 55th Street to find a line down the street at 6pm on a Thursday night. Once inside we were greeted with cool artwork adorning the walls, a lively and fun atmosphere and a staff that was so knowledgeable and welcoming that we almost questioned whether we were actually in New York City! The Texan Burger is a true Black Stand stand by burger. You can never go wrong with this juicy burger. When considering what to order, we decided to try one of our old favorites – The Texan Burger (their prime burger, aged cheddar, crispy onion ring, bacon, sweet baby rays bbq, and mayo) – and then be a little more adventurous and try one of the newer burgers on the Black Tap menu – The Carolina Burger (their all American burger with smoky pulled pork, buttermilk slaw, Carolina BBQ). The Carolina Burger is topped with the most delicious slaw and ordering Black Tap’s house made Sweet Potato fries as the side of choice was definitely the way to go. 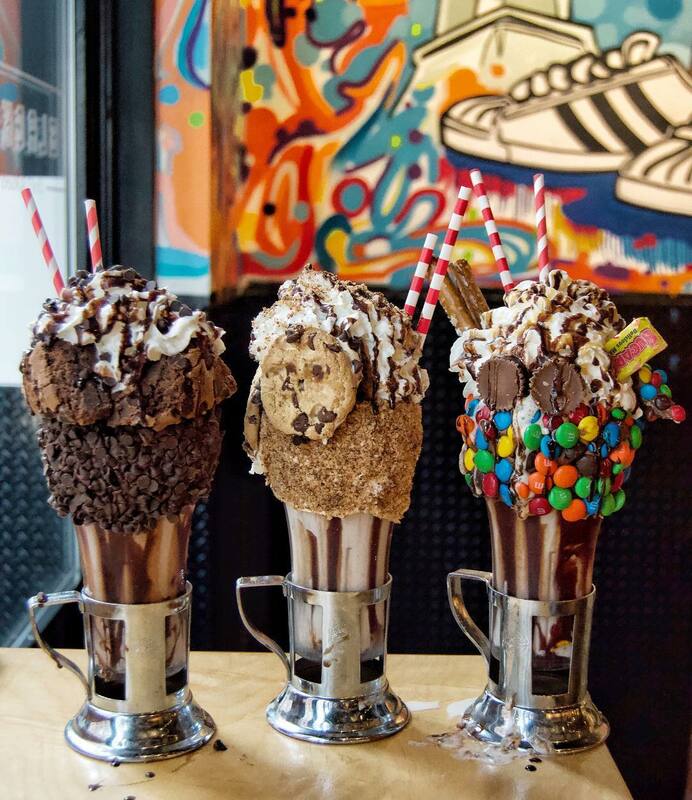 After finishing these ample and uniquely delicious burgers should certainly render it impossible to eat another bite … when visiting The Black Tap, it’s mandatory to order one of their “Crazy Shakes” … well, not mandatory, but you are “CRAZY” if you don’t. Once again, we decided to go with our favorite stand by, The Cookie Shake. The Cookie shake is a Vanilla Cookie Shake with vanilla frosted rim with cookie crumbles topped with a ‘cookiewich’, crumbled cookies, chocolate chips, whipped cream & chocolate drizzle. Oh my! And, in an effort to remain open minded, we also ordered one of Black Tap’s newer Crazy Shakes – The Cake Shake – which commands a $2 up-charge and is only available in limited quantities each day because the chef makes this confetti cake in house! Take it from us, while the shake is delicious, the cake is even better!!! The Cake Batter Shake has a vanilla frosted rim with rainbow sprinkles topped with a house made Funfetti cake slice, whipped cream, rainbow sprinkles & topped with a cherry! Happy Birthday to US! So if you’re thinking of checking out any of the three Black Tap locations in NYC, DO IT! The brand also has a location in Las Vegas at The Venetian, with plans to open soon in Dubai. So if you visit any of those cities, you’ll be lucky to find the Black Tap there as well! In NYC’s Midtown location, the thing we fell most in love with was our server Carmelina. She was friendly, informative and so much fun to dine with! We’ll definitely be back soon! Previous articleGet your fabfitfun spring box! Next articleDr. Sarah Talks with country musics hottest duo Brown and Gray!